Jews captured by German troops during the Warsaw ghetto uprising in April–May 1943. 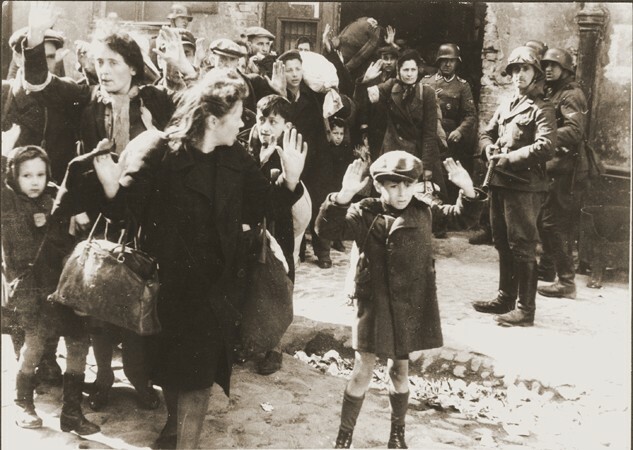 This photograph appeared in the Stroop Report, an album compiled by SS Major General Juergen Stroop, commander of German forces that suppressed the Warsaw ghetto uprising. The album was introduced as evidence at the International Military Tribunal at Nuremberg. In the decades since the trial this photo has become one of the iconographic images of the Holocaust.